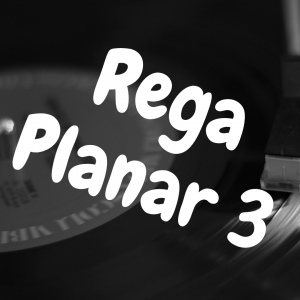 You are here: Home / Turntable Needles & Cartridges / What’s the Best Phono Cartridge Under $100? When looking to improve the sound quality of your turntable, the record player cartridge is often the first place to start. In fact, I’d argue it’s the most important part of your turntable in terms of getting the best sound quality out of your records. Therefore, in this article, I’m going to break down the best phono cartridges you can buy under $100, and help you understand what makes each recommended cartridge so special and worthy of your consideration. How Does a Phono Cartridge Work? The phono cartridge is a mechanical device used to read and convert vibrations picked up from the stylus or needle as it traces the grooves of a record. These vibrations are turned into an electric signal, which is then amplified through a phono preamp to produce the sound that passes through your speakers. There are five elements of a cartridge which include the stylus, cantilever, magnets, coils and body. As stated previously, the stylus is the point where the record player meets the record to track the unique modulations within the grooves. 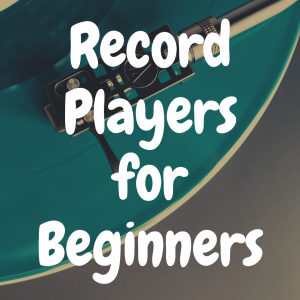 The stylus for record players are attached to a cantilever, typically constructed from aluminum or born, and send the vibrations it produces by tracking the record grooves through the cartridge’s internal coils or magnets to produce an audio signal. The body of the cartridge is mounted to the tonearm to provide a stable position while tracking in order to produce accurate playback. The stylus is by far the most expensive and important component of a cartridge, as it has the most direct impact on sound quality. Styluses come in different shapes to fit within the grooves and the two most common are elliptical and spherical. Because record grooves come to a point and they are the shape of an upside-down triangle rather than rounded, an elliptical stylus is able to sit deeper within the grooves allowing it to read more information equating to a deeper sound. Elliptical styluses are typically the preferred shape for audiophiles for this reason, but they are also usually more expensive than their rounded counterparts. 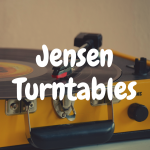 However, because spherical needles typically sit higher within the groove, they have the potential to create less wear on a record, making it the preferred choice for DJs who physically shift their records to create sounds. Stylus tips, where the needle makes direct contact with the record, are most commonly found with small, polished diamond tips or industrial gemstones. 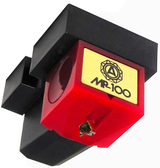 Moving magnet and moving coil cartridges are the two most common types of cartridges. Moving magnet or MM cartridges are the more common of the two, less expensive and generally, a better value. These cartridges house a tiny magnet within the cantilever, which is balanced between two copper coils positioned at the top and bottom of the interior of the cartridge. The magnet vibrates as the stylus tracks the grooves of a record to produce a current within the coils, resulting in a small electromagnetic generator within the cartridge. You can expect a rich, smooth sound from MM cartridges and they offer a variety of shapes, sizes and levels of quality along and they are compatible with any phono input, making it a much more versatile choice. Another valuable feature is the ability to replace or upgrade the stylus without changing the entire cartridge, making it a great option for both beginners and audiophiles. Moving coil or MC cartridges differ in that they feature tiny coils wrapped around the magnet in the cantilever that vibrate as the stylus tracks a groove creating a similar electromagnetic generator. However, because these coils are much smaller than the ones featured within an MM cartridge, their output voltage level is also much smaller than one produced by an MM cartridge. This means that a high-gain phono cartridge is required to maximize sound, these are much more expensive and require specifically compatible preamps, but also physically heavier, making the cartridge more responsive to higher frequencies within the grooves to produce less distortion and a higher quality of sound overall. Rather than being fixed directly to the tonearm, replaceable cartridges are connected to them by being mounted to an attachment that sits at the end of the of the tonearm and attached to wires that run through the tonearm. The type of mount featured depends on the tonearm itself, but the two most common mounts are the standard and P-mount. Different cartridges are also compatible with different mounts. Adapters are available, but this is an unnecessary extra step and one more place where things can go wrong with your sound along the way to your speakers, so it is important to make sure your mount is compatible when shopping for a new cartridge. The standard mount is generally compatible with a wider range of cartridges and allows for more control during the installation process. A standard mount cartridge is attached to the bottom of the mount’s headshell using two small screws and connected to the tonearm by attaching four wires to their respective binding posts on the back of the cartridge. These are typically color coded and most cartridges will come with detailed instructions on how to attach them. P-mount cartridges are mounted directly to the tone arm using one single screw and they feature plugs on the back rather than posts and they are inserted into corresponding outlets within the tonearm. This does not allow for any alignment adjustments and the P-mount is typically found on lower quality turntables. Let’s begin with the Ortofon 2M Red. Ortofon is a Danish company with more than six decades in the market as one of the most trusted names in the world of cartridges and their Red model is the midway point in their line. At $99 it comes in just under budget and provides accurate sonic reproduction and a crisp, warm sound that translates across a wide variety of music genres. Its solid headshell construction is bottom mounting and compatible with standard mounting systems. The headshell body itself is constructed from a special compound commonly used within the medical industry, making it highly durable and helping to reduce unwanted vibrations. This is a moving magnet cartridge that features Ortofon’s signature split pole pin technology, providing a flat frequency response similar to that you would find in a moving coil cartridge without the high price point and exclusivity of an MC cartridge. The 2M Red is easy to mount and install and its weight makes it compatible with most commonly found turntables on the market today. The tipped elliptical diamond stylus contributes to the high sonic accuracy and crisp sound reproduction. 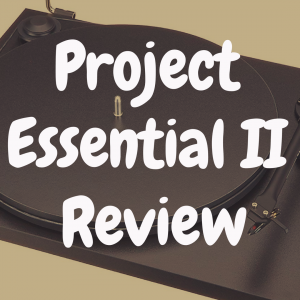 Its ease of installation, wide range of compatibility and great sound quality make it an excellent choice for those looking to make a jump in the quality of their turntable without breaking the bank. 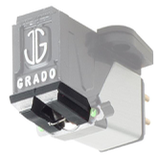 Grado is an American company and a highly reputable manufacturer of cartridges, even being credited as the inventors of the moving coil cartridge. Their Prestige line is the most budget friendly that they offer and though the Green model is toward the bottom of the food chain, it still provides very high sensitivity and a clear, detailed sound while remaining under budget at $95. All models within the Prestige line share a similar cartridge construction, but increase progressively in sound quality and price. The Green model is assembled with a fixed magnet and coil along with a lightweight soft-iron piece between the stylus and cantilever that’s motion changes with magnetic field distribution to provide that high sensitivity Grado is known for and makes it compatible with most amplifiers. Its tracking force range also allows for a wide range of tonearms and the cartridge’s standard two-hole mounting system makes it compatible with most p-mount headshells. The stylus is easily replaceable, and the cartridge will fit any stylus within the Grado Prestige line, so users can upgrade or replace the stylus on their own at any time. It handles a dynamic range of music while maintaining a crisp, clear quality you would expect to find at a much higher price. The Green model is identical to their Black model however, Grado runs extensive tests on each of their styluses and the top performing 15% of these styluses are labeled as Green rather than Black, with the only visible difference being two small green dots on the cartridge. However, for an increase of only $20, there is a noticeable difference in sound quality that is certainly worth the upgrade while remaining under budget. The only con is that it can be a bit more difficult to install because it uses nuts to fasten to the mount rather than just screws, but nothing to be scared of. Audio Technica is one of the most well-known names in HiFi and one you can trust to deliver a quality product. Their AT100E cartridge is available for $91 and provides a balanced sound with responsive record tracking. 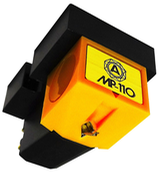 The AT100 series features a unique dual magnet and vibration system for optimal efficiency in magnetic generation. The structure of the cartridge has also been developed to create ideal contact between the stylus and grooves through improved performance of the vibration system to handle low frequencies, bold midrange and distinct high frequencies with uniform quality. The AT100E even comes with its own screwdriver, a brush, screws, nuts and detailed instructions, but the con is, you’re going to need them. To properly use this cartridge, your tonearm will likely need to be re-balanced to accommodate the recommended tracking level of 1.4 grams, which can be tedious, but if done right, you’ll only need to do it once. Additionally, depending on the type of music you listen to, it can produce a distorted sound at high frequencies, but overall, this cartridge will likely be a welcome upgrade from most beginner cartridges. Though Shure may not be the most recognizable brand on the list, their M92E is a very versatile moving magnet cartridge at a bargain price of $49. It has a very low tracking force for minimal ware on your records and its universal mounting system and included adapter make it compatible with both standard and P mounts. Its bi-radial diamond tipped stylus and aluminum alloy cantilever provide accurate tracking and a smooth sound at a wide range of frequencies that can be described as neutral and accommodating to a variety of genres. 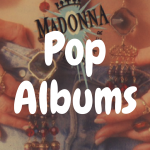 However, it does lack the depth that some of the more expensive cartridges on this list deliver at higher frequencies, which may not be an issue depending on the type of music you listen to. Nagaoka is a European company that has specialized in cartridges and HiFi equipment since 1940 and they make every component of their cartridges in house and scrupulously test them before they make it to the consumer. The MP stands for Moving Permalloy and is their own take on the MM style of cartridge, the 100 is the bottom of the line, but at $90 it is a quality choice within the budget. It offers a superfine conical diamond tip stylus, a powerful samarium cobalt magnet, lightweight aluminum alloy cantilever and the cartridge is made from reinforced carbon fiber plastic, so it is as durable as well as capable of producing a high quality of sound. You can expect a clear, natural sound reproduction across a wide variety of frequencies and genres and protection against a skipping stylus and wear on your collection. Nagaoka recommends replacing the stylus between every 150-200 hours to help minimize the ware on the grooves, but the good news is that the stylus is easily replaceable.